There are many products available today for orchid growing, most far more expensive than necessary. Hobbyists usually just pay the price since they have only a few plants. As your collection gets larger or you wish to be more frugal there are many ways to reduce the cost of your hobby. Many hobbyists got stared when presented with a gift of an orchid and are still in the early stages of learning to grow. Many of the big-box stores get a regular supply of orchids, which are sold as pot plants. Some orchids do not sell and go out of bloom. These are either tossed or placed on a sales table at a reduced price. Caution should be exercised when purchasing these orchids, but some bargains can be found. Inexpensive orchids also make great plants on which to experiment. Learn to repot using these orchids. Try different media and pots. All of these “experiments” will teach you to be a better grower and make you more confident when you purchase an orchid that you really like. Most hobbyists err in the beginning because they are afraid to damage a newly purchased orchid so they do nothing when a problem develops. 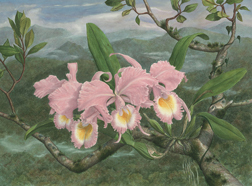 Fertilizer is a classic example of the concept that excellent orchids do not require the most expensive products. One of my favorite growers that proved the concept was the late Ralph Wasdon from Greenville, NC. He used K Mart, soluble fertilizer and grew orchids as well as anyone I ever met. When asked to speak about his prowess in growing orchids he always replied that it only took five minutes to explain his methods; water when needed, fertilize when you remember, and put your plants under the pines when it was warm enough. Practical wisdom is often overlooked when growing “exotic” orchids in favor of the elaborate and expensive. Powdered cinnamon is a very effective fungicide applied directly to the wound. Many growers buy cinnamon powder by the bag and sprinkle it over roots and rhizome just before placing a newly repotted orchid in a new pot. This non-toxic and relatively inexpensive fungicide has the added benefit of a nice fragrance. Another simple, and amazingly effective, anti-bacterial/anti fungal agent is Hydrogen Peroxide. It is available everywhere for topical use. Joe Grezaffi introduced me to its use. Whenever he saw crown rot in a phal or rot on a cattleya he poured hydrogen peroxide right in the crown or damaged area. For awhile, I used half strength, but found that there was never any damage from using it full strength. It even stops pseudomonas rot on phal leaves that I once cut off entirely when I saw just a small rot spot. One of the most significant changes in fertilizer for orchids is the availability of a slow release fertilizer named Nutricote. This product is being used by many commercial orchid nurseries, but is even more important to the hobbyist who has just a small number of orchids. Available as Dynamite in small quantities from Home Depot stores, this is an easy to use fertilizer that delivers a constant supply of nutrients for a set amount of time. Most last for six months and provide micronutrients as well.